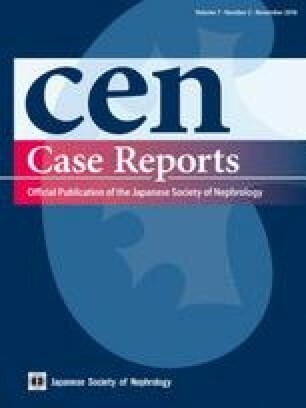 We report a case of distal partial trisomy 1 from q32.1 to 41 that have exhibited proteinuric glomerulopathy. The patient was a 17-year-old adolescent with clinical features of low birth weight, mild mental retardation and mild deafness, from the birth. He exhibited non-nephrotic range proteinuria with the mild obesity since the age of sixteen. Image studies did not reveal morphological abnormalities of the kidneys. Renal biopsy findings showed no definitive evidence of primary glomerular diseases, and were characterized by a very low glomerular density, glomerulomegaly and focal effacement of podocyte foot processes. Therapies with dietary sodium restriction, body weight reduction and the administration of angiotensin receptor blocker markedly reduced his proteinuria. It was likely that mismatch between congenital reduction in the nephron number and catch-up growth of the whole body size played a major role in the development of glomerular hyperperfusion injury. At present, the direct contribution of genetic factors due to this chromosomal disorder to such a substantial reduction in the nephron number remains uncertain. Portions of this study were presented at the American Society of Nephrology Kidney Week 2017, November 2017, New Orleans, LA. In this article, studies of human and animal participants are not included.